Kaneohe police Maj. Susan Dowsett talked about the drugs, money and equipment seized during yesterday's early-morning raid on a Keaahala Road home. Two people were arrested. The state took custody of six children ranging in age from 5 months to 11 years old yesterday after their parents were arrested for alleged drug dealing from their Kaneohe home. Police raided unit A at 45-571 Keaahala Road at 6:11 a.m. and found small amounts of crystal methamphetamine, marijuana and $15,000 in cash, as well as an expensive video surveillance system and other electronic equipment. Police described the living conditions of the home as "deplorable." 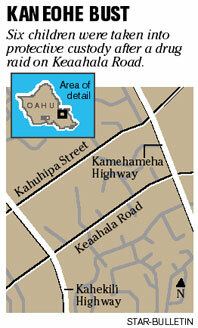 "They said the stench was horrible," said Maj. Susan Dowsett of District 4, which includes Kailua, Kaneohe and Kahuku. "Food on the stove was a couple of days old. There were dirty diapers strewn all over the whole house. The living conditions were pretty poor." Dowsett said while there did not appear to be enough food in the house for a family of eight, the couple had enough money to set up a security camera outside the home and link it to a video screen set up inside their bedroom. Other expensive electronics included a flat-screen television, numerous DVDs and a stereo and computer system. "Apparently these people did not have the means to acquire those items except through illicit purposes, and that's why they were recovered," said Dowsett. The female suspect was arrested for investigation of promoting a dangerous drug in the second degree, possession of drug paraphernalia and promoting a detrimental drug. The male suspect was arrested for investigation of promoting a dangerous drug in the third degree, as well as drug paraphernalia and promoting a detrimental drug. Both suspects were booked on six counts of endangerment of a minor. State Child Protective Services officials took custody of the children. Police said the couple, both 28 years old, were not married and that some of the children were the male suspect's, while some belonged to the female suspect. It was not known if the couple had children together. Police said they had investigated reports of drug sales at the house since October, when neighbors began filing complaints about increased activity there. The amount of drugs seized yesterday included seven grams of crystal meth and 18 grams of marijuana, but Dowsett said the most telling sign was the cash recovered. "Even if you recover a small amount of drugs, a user wouldn't usually have $15,000 in cash on them," she said. "In fact, I don't know too many people who would have that laying around their house."